Abstract: Materials related to Miriam Wolfe, one of the 35 students studying abroad through Syracuse University's Division of International Programs Abroad (DIPA) killed in the bombing of Pan Am Flight 103 over Lockerbie, Scotland, including a typescript of Rosemary Mild's "Miriam Continued: Love, Lessons and Politics"
Miriam Luby Wolfe (1968-1988) was among the 270 victims of the bombing of Pan Am Flight 103 over Lockerbie, Scotland on December 21, 1988. She was returning home from a semester in London during which she had studied dance, dramatic literature, acting, voice, and art history, in addition to completing an internship at London's Kingshead Theatre. Miriam was survived by her mother, Rosemary Mild; her stepfather, Lawrence Mild; her father, James Wolfe; and her stepmother, Rosemary Wolfe. Three scholarships have been established in Miriam's honor. Her mother recalls that Miriam's "exuberance was all encompassing: she didn't walk, she bounced, her luxuriant curls bobbing, intense blue eyes sparkling." 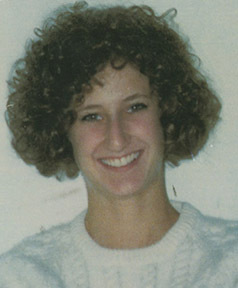 The Miriam Luby Wolfe Family Papers contain materials related to Miriam Wolfe, one of the 35 students studying abroad through Syracuse University's Division of International Programs Abroad (DIPA) killed in the bombing of Pan Am Flight 103 over Lockerbie, Scotland. The collection consists of clippings, including a press release for Rosemary Mild's Miriam's World - And Mine, and writings about Miriam by her mother, Rosemary Mild. The Miriam Luby Wolfe Family Papers were donate by Rosemary Mild in 1999 and 2003. The Miriam Luby Wolfe Family Papers are fully processed.